GRAVENHURST – I caught the opening night of Greater Tuna Wednesday. It was the final gala of the season for the Muskoka Summer Theatre festival at the Gravenhurst Opera House. It’s a funny, if deeply dated (1981), satirical take on life in the South. If you like Robin Clipsham — and who doesn’t love her excellent eccentric characters — you’ll LOL. While she could easily carry off this as a one-woman show — like Rod Beattie and his Winfield Farm series — she is perfectly teamed with the equally talented Allie Dunbar. They feed off each other with flawlessly timed comedic exchanges. The duo’s chemistry is reminiscent of their similar roles last season in Old Wives Tales. Muskoka Summer Theatre artistic director Dave Campbell, calls Greater Tuna one of his favourite plays. “They say it’s healthy to laugh at yourself … but it’s really much more fun to laugh at others!” starts the program notes. “Tuna takes a magnifying glass to small town life …. Greater Tuna is 50 minutes of running over the dog, and 50 minutes of backing up and running over the dog again, says reviewer Mark Clairmont. “Two brilliant actors play 20 characters at breakneck speed. Hold on to your seat … this is fast-paced, side-splitting, small-town fun,” the note concludes. For sure, playwrights Jaston Williams, Joe Sears and Ed Howard capture the essence of a bygone era that is cliché-filled and much more matured almost 40 years later. It’s a town that remains alive here as a testament to a racist, ill-mannered, stupid, bully culture that if not dead should be in 2018 — despite the Twittersphere. You could almost call it Greater Trump. They play 18 other community characters the DJs come in contact with over the course of typical day. Predictably outstanding is Clipsham in one of the lead roles as Bertha Bumiller, as she channels a cross between her signature role as “Peaches” and Granny on the Hillbillies, while dressing and looking a lot like one of Carol Burnett’s old lady figures. She is as convincing and enjoyable as Elmer Watkins, head of the Ku Klux Klan, Pearl Burris who hates dogs and particularly a table-crawling cop, Sheriff Givens. Dunbar, who also has a decent stage CV including off-Broadway and the second season of the Handmaids Tale, excels as Petey Fisk the humane society manager who keeps peddling unwanted puppies. And as Bumiller’s nephew Stanley, a juvenile delinquent who does his aunt’s dirty work along with his own form of social justice. Greater Tuna, is in car-accident-watching-way hard to ignore. It’s a relic of the past that belongs there — not on a stage in Muskoka where local theatre is working hard with a modicum of deserved success to become more becoming. More serious, more credible. While professional, Tuna is an odd choice for Campbell and town arts and culture manager Krista Storey to sum up their otherwise successful summer of music and entertainment. But it’s in keeping with a recurrent retro perspective at the expense of more forward, socially conscious theatre that informs, challenges and entertains. The humour is squeamish and uncomfortable in enlightened days. How would audiences react if Greater Muskoka was the subject? It’s 50 minutes of running over the dog, and 50 minutes more of backing up and running it over again. It should leave Clipsham and Dunbar wondering: Are they laughing with me or at me? 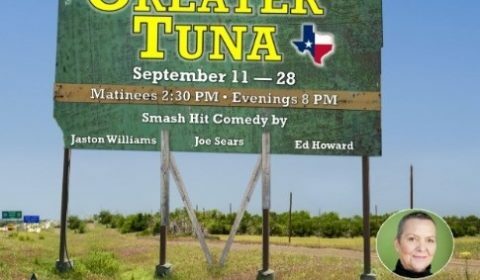 Greater Tuna runs to Sept. 28, with afternoon matinees at 2:30 p.m. and 8 p.m. evening shows. Tickets are $40.